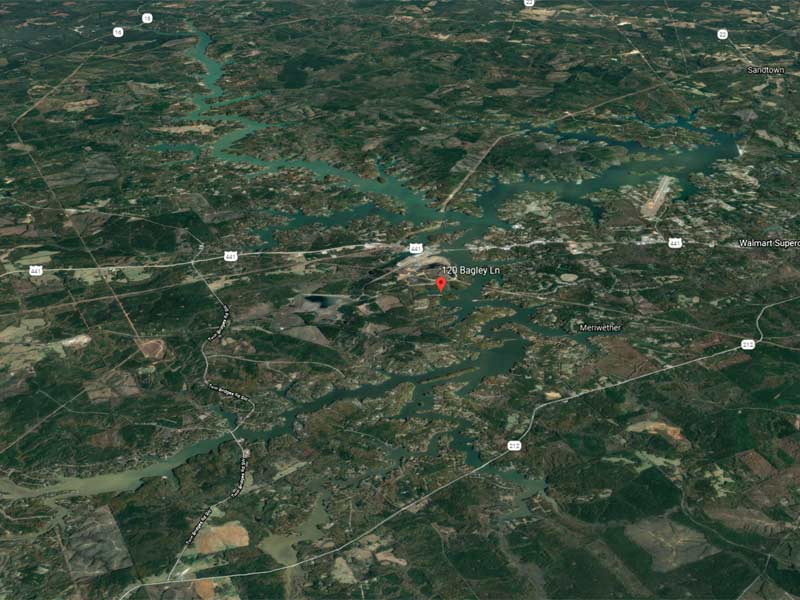 Athens AL - Every year the top angling couples from across the nation converge on a body of water to compete for the title of American Bass Anglers Couples Series National Champion, this year that body of water was Lake Hartwell. 65 teams blasted off from the Green Pond Landing in Anderson, SC with the hopes of catching limits and winning the title. 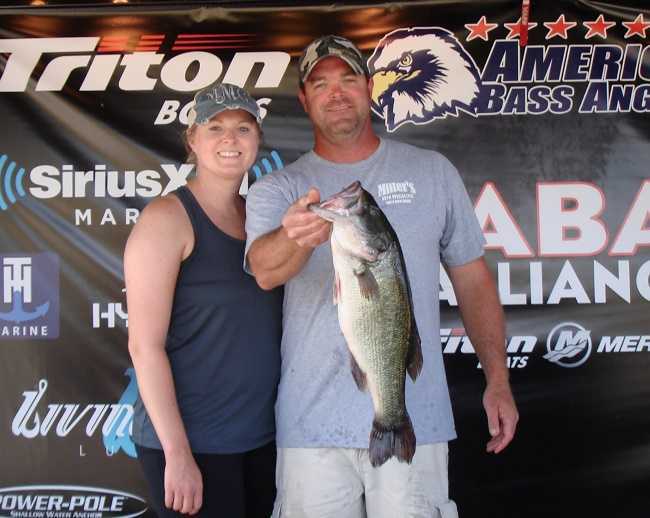 For the team of Jason Burroughs and Samantha Tellock, those hopes were fulfilled, bringing in 5-fish limits both days for a total weight of 22.75-lbs sealing their victory and giving them the title of American Bass Anglers Couples Series National Champions. 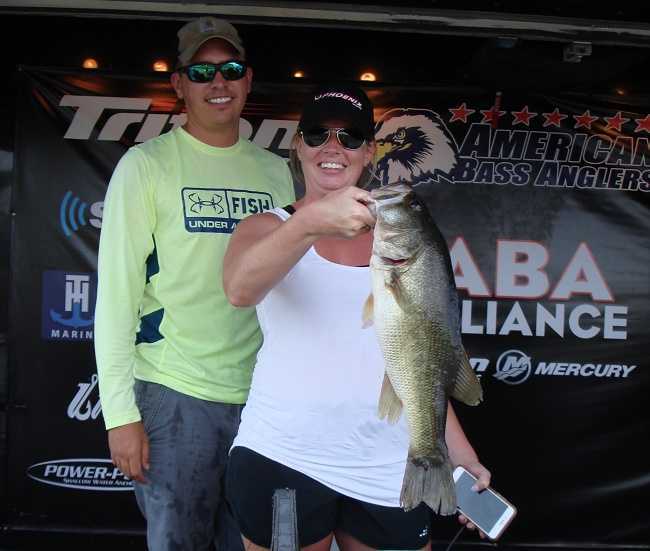 On day one Jason and Samantha brought in a 5-fish limit that tipped the scales at 12.91-lbs anchored with Men’s Big Bass for day one, a nice kicker weighing in at 3.71-lbs. Going into day two with the lead they stayed consistent and brought in another 5-fish limit that locked in the scales at 9.84-lbs. giving them a two-day total of 22.75-lbs. 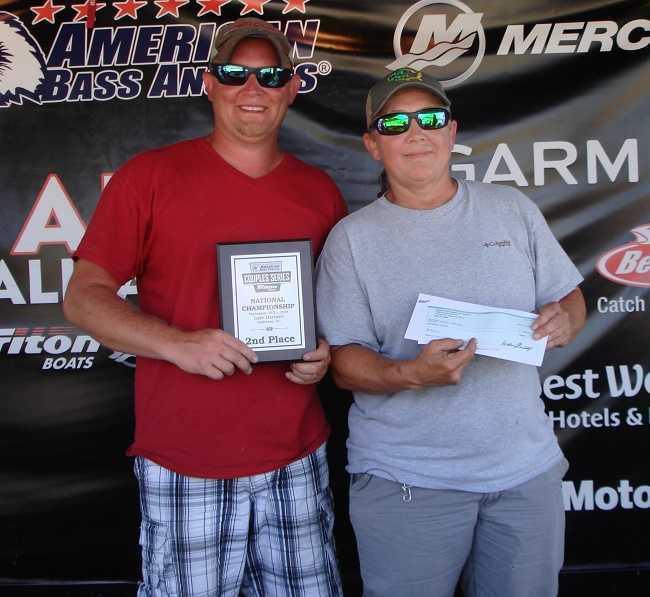 For the victory, they took home a check for $4,000 plus an additional $320 for Men’s Big Bass on day one. “We didn’t get many bites, only six the first day and eight on the second day. We fished the lower end of the lake, you could see the dam from where we were at. We stayed offshore in around 25-35 feet of water, throwing chrome topwater lures. It was a team effort, we both caught fish just not a lot of them. And a big thanks to Anderson, SC for being such great host,” said Burroughs. Second place was claimed by the team of Jaris and Sherri McGee. On day one they brought a 5-fish limit to the scales that went for 8.97-lbs. They managed to bring in another 5-fish limit on day two that locked in the scales at 10.91-lbs anchored by the day two Women’s Big Bass a nice kicker that weighed 4.07-lbs. They finished with a two-day total weight of 19.88-lbs. For their second-place finish, they took home a check for $800. “We ran all over the place, we burnt 20 gallons of gas the first day and 22 gallons on day two. Running around that much, we got to see a lot of the lake we had never seen before. We threw top water all day both days buzz baits, toads, and whopper ploppers,” said Jaris. “I caught the women’s big bass early in the morning on a bone colored whopper plopper,” stated Sherri. “Since this is the second year in a row that she has caught the women’s big bass on day two, we’re not going to call her momma anymore, instead we’re going to start calling her second day Sherri,” added Jaris. Third place was seized by David and Ashley Sutton. They brought in a 5-fish limit on day one, weighing 9.72-lbs. They couldn’t find the fifth fish on day two brining back only 4-fish that locked in at 9.50-lbs, giving them a two-day total of 19.22 lbs. They took home a check for $575 for their efforts. “We caught everything on buzz baits and whopper ploppers. The biggest fish we caught came on day one around 1:00 pm. We struggled on day two, but the wife pulled us out, she pulled in the last 2 fish we needed to keep us in there,” said David. 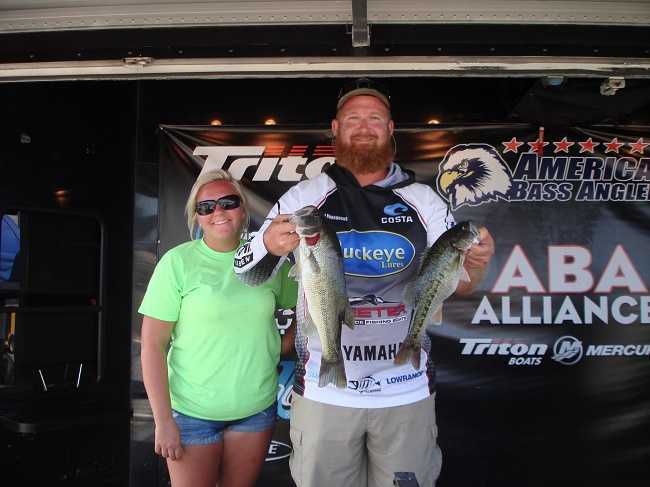 Fourth place was taken by Brody and Briana Kimbrell with a two-day total weight of 19.01-lbs. Briana caught ooverallWomen’s Big Bass on day one a beautiful fish that locked in the scales 4.43-lbs. 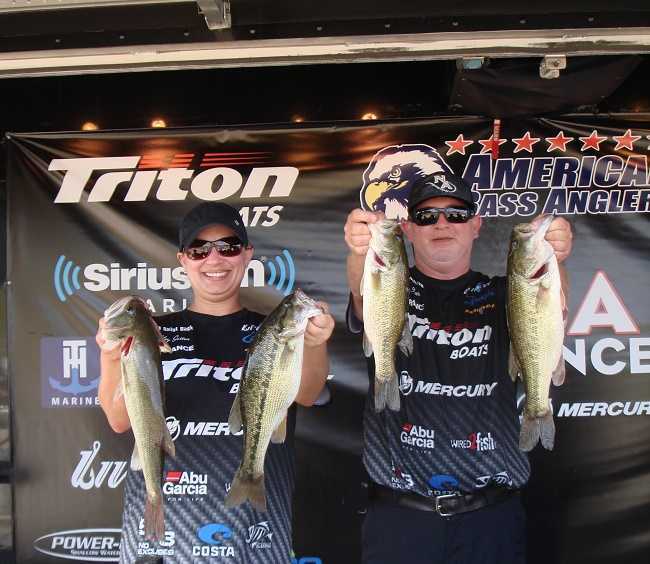 For their fourth place finish, they took home a check for $400 plus an additional $320 and a brand-new Abu Garcia Revo X for the big bass. 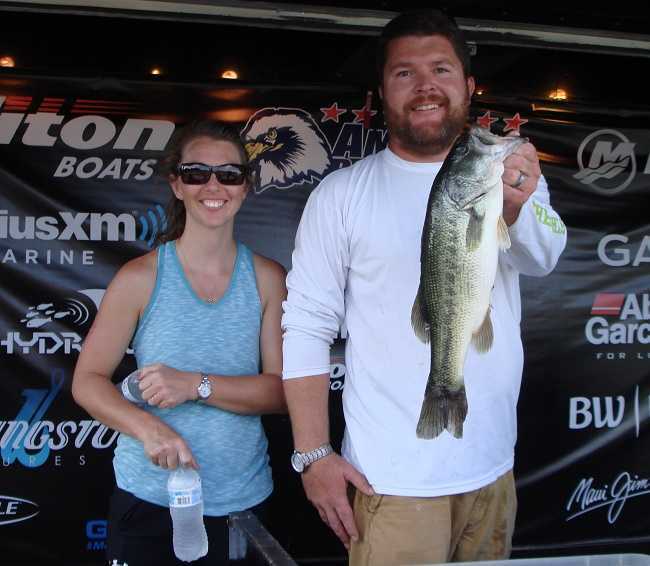 Rounding out the top five was Bo and Jessica Price with a two-day total weight of 18.83-lbs. Overall Men’s Big Bass was caught by Joey Miller that fish locked in the scales at 4.87-lbs. 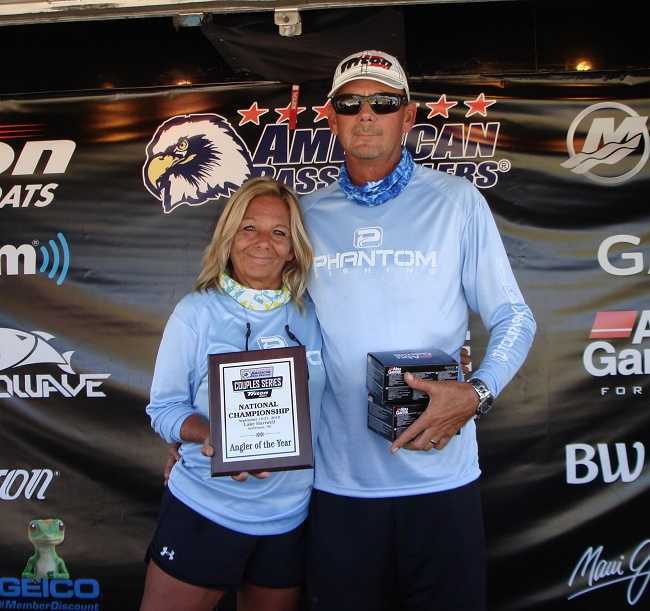 The coveted title of American Bass Anglers Couple Series Anglers of the Year was claimed by Dale and Victoria Goff. They worked hard all year to accumulate the points needed to be victorious. This is their second time claiming the title, the first was during their first season fishing the Couples Tour five years ago. “This is our fifth year fishing the Couples Series and we love it. 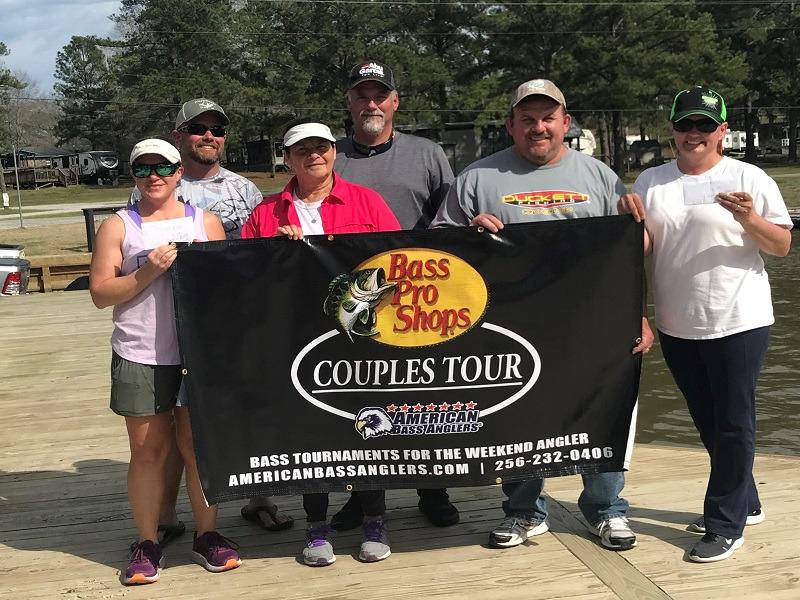 I fished other trails and local clubs by myself for a long time and one day I got up with JB and Tammy and they told me about the Couples tournaments and how much they loved it, so we decided to give it a try. Victoria fell in love with it immediately, and we’ve been fishing them ever since. We were lucky enough to have some of the best directors ever, Don and Martha Goodfellow. They put on some wonderful tournaments and are just great people,” said Dale. 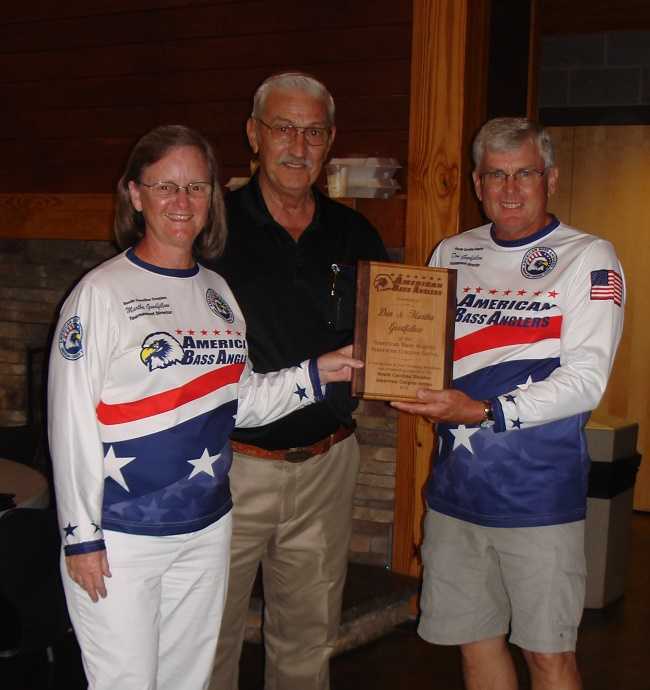 This year Don and Martha Goodfellow were honored as the Directors of the year. They have run the South Carolina Couples Series Division for over ten years now and have built up one of the top Couples Division in the nation. Every one that has fished with them or in any of the tournaments that they have run will tell you just how great they are.